In a departure from its invitation-only format of the past, USA Basketball instituted a new application process to include more participants at the U16 national team trials for 2011. Two applicants from Indiana are listed on the trial roster — 5’10 Columbus East freshman forward Allyson Bunch (right) and 5’6 Bedford North Lawrence freshman forward Brittani Rizzi. 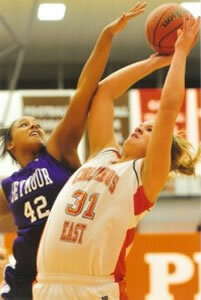 Bunch and Rizzi join sophomore invitees Stephanie Mavunga of Brownsburg and Taya Reimer of Hamilton Southeastern. Aside from the 35 athletes extended invitations to the trials, players not invited could apply to attend by submitting the required documentation & fees, providing their own transportation and paying for related expenses. Up to 200 applicants would have been allowed to participate, but only 86 applicants are in attendance over and above the 35 invitees, for a total of 121 participants. The trials are expected to get underway late tomorrow afternoon at the U.S. Olympic Training Center (USOTC) in Colorado Springs, Colorado. Due to the number of participants, players will be divided into two groups for three opening skills sessions and the first four trials sessions. Roster reductions may begin following the completion of the second trials session Saturday morning, and the team is expected to be announced on Monday, May 30.